Well, it’s official: The natural world has thrown off the covers and been served it’s morning cup of coffee! With this week’s warm weather, the farmland is truly abuzz: A motley crew of native and honey bees and other pollinators jets and bumbles throughout the air, alighting on every flower (mustard, vetch, bell bean, tree, and wild flower) that can be found; willow catkin fluffs are floating everywhere on the sweet, warm breeze; and the greenhouses, farmyard, and fields here at Green Valley Community Farm are abuzz with human activity, as we dust off, gear up, and sow the first seeds of Summer. And we’re so happy to be penning to you, dear members, the first of many farm updates for the 2018 growing season! You’re invited to our annual Spring Farm Party! Come meet the farm & farmers of this land, eat, drink, and be merry with other members! Feel free to bring friends! If have any friends or family who you think might be enjoy being a member, please let them know about us, or bring them to the April 22nd Farm Party! This week, we’ll mow this cover crop down and it will continue it’s magical life giving journey as its thousands of pounds of carbonaceous organic tissue will be digested into the soil… feeding, enriching, and building life there this season and for many seasons to come. 2018 CSA MEMBERSHIP RENEWAL: We can't wait for next season and we hope you can't either! We'll send out an email opening sign-ups in early January -- and you'll be first in line. 2018's CSA season will start in late May or early June. Tell your friends as we will be expanding the CSA next year. Thank you SO much for your support this year and we hope to see you on the farm this winter and next year! *Hon Tsai Tai Kailaan a Chinese speciality green brassica with pencil-thin, red-purple, budded flower stems. It has a pleasing mild mustard taste for use raw in salads or lightly cooked in stir-fries or soups. We're excited to bring our first wild foraged native food to the share this week. The California Bay Laurel (Umbellularia californica aka Oregon myrtle, bay tree, pepperwood, spice-tree, California olive) is a tree endemic to California and southern Oregon. It thrives in coastal forests within 160 miles of the ocean and produces olive sized fruits with oily flesh and a seed shaped like a little avocado pit. The leaves and flesh of the fruit contain strong smelling volatile oils that kill germs, fungi, and even insects. (Woodrats nibble bay leaves and spread the around their homes to keep fleas and parasites away.) Bay leaves were used by native peoples as a medicine, a purifier, a food seasoning, and an insect repellent. The fruits, both the flesh and the nut, were eaten by many native tribes. Ohlone and Pomo people ground dried nuts into "energy balls" or cakes eaten when traveling or hunting or sprinkled it on around food as a condiment. The nut contains a caffeine-like stimulant, so think twice before feeding them to the kids before bedtime! California laurel nuts mature and drop in late October and November. 2. Place unshelled nuts on a cookie sheet and bake for approximately 35 minutes to evaporate oils -- they are done when the nut inside the shell is somewhere between the color of coffee with cream and the color of chocolate. The most important indicator is that there are not enough of the essential oils left to create an unpleasant burning sensation in the back of your throat. The desirable flavor is reminiscent of unsweetened cacao or burnt popcorn. 4. Melt chocolate in a double boiler. 5. Place one or two bay nuts in each compartment of an ice cube tray. 8. Set in freezer for about 15 minutes. Variation #1: The Occidental Arts and Ecology Center has a great Bay nut infused cheese cake recipe. Variation #2: After roasting nuts, grind with sugar and cocoa powder to create a delicious chocolate-like dessert. PAINTED MOUNTAIN CORN FLOUR:Grown next to the Jack-O-Lanterns, harvested by you(! ), milled at Tierra Vegetables in Windsor, and to your table, we're excited to bring the Painted Mountain Cornflour to the share this week. Painted Mountain corn is a hearty heirloom from Montana bred as an early-harvesting, all-purpose flour corn. This fresh flour (harvested in October and ground last Thursday) can be used in infinite ways; pancakes, crepes, cornbread, etc. Here is a link to a great corn pancake recipe from Bob's Red Mill. FARMSTORE: A new supply of whole chickens from Parade the Land arrived at the Bramble Tail Creamery today. There's also beef raised 100% on Green Valley pasture, Hands Full Farm eggs, Bramble Tail milk and cheese (herdshare members only), new herbal remedies by Aubrie, and Firefly chocolate. A couple last frozen Hawk Hill Sourdough Bread loaves await you in the white freezer in our barn. It was a bittersweet harvest morning for Kayta and I today -- the last Friday morning harvest of our 2017 CSA season. It has been such a wonderful year of growth, joy, and community... the highlight for us being getting to know each of you, your wonderful children, and seeing you interact with the farm. We cherished the presence you all brought to the farm this season and we will miss seeing you each week! We encourage you all to visit the farm at least once this winter -- to say hi, to pick some herbs or late strawberries. And, if you have a moment, to stand still for a moment in the fields. Within that slumber next season churns: The cover crop stretches its living roots deep into the soil below where subterranean creatures break down this year's crop residue, like so many memories, into the raw materials that will make up next year's bounty -- next year's story. Listen closely and you can hear the land dreaming. For now, it is time for your farmers to rest, to reflect, and to do a little dreaming ourselves. Thank you all so much for the memories this year, here's to many more to come. This week we will be distributing Floriani Red Flint Cornmeal. Floriani is an heirloom variety from Northern Italy, bred for the delicious and beautifully red-speckled polenta it makes. Our cornmeal is special in that it is fresh: Harvested in October, ground on Thursday, and kept frozen to preserve the germ. Grain this fresh is hard to find nowadays. We think you'll notice a difference. 4 parts liquid: This can be a combination of water, milk, or stock. We usually do half milk, half water. The more milk you add the brighter the color the final dish will be. Bring the liquid, salt, and butter or oil to a boil. Once you have a rolling boil, whisk in the polenta meal slowly. Turn the heat down low and continue simmering either as long as you have time for or until the polenta reaches a creamy consistency. If you cook for 20 minutes or longer, you may wish to continue to add a little liquid as it absorbs. For variations, add crushed garlic, sundried tomatoes, or Parmesan. Pour any leftover polenta into a shallow pan and refrigerate. After it sets, this can be sliced and pan fried. Don't forget to check out the Bramble Tail Creamery for more add-on to your share: Beef raised 100% on Green Valley pasture, Hands Full Farm eggs, Parade the Land Whole Chickens, Bramble Tail milk and cheese (herdshare members only), herbal remedies by Aubrie, and Firefly chocolate. Hawk Hill Sourdough Bread loaves will be available in our barn this week. This year, as a community, we shared the inherent risks of agriculture; we shared the labor and the fruits. Kayta and I feel it is only fitting we share a vision as well. Here, two weeks away from the end of our 2017 CSA season, we thought we might share with you our vision for the future of Green Valley Community Farm. Of course, the fate of the farm and the exact shape it takes are beholden to myriads of unknowns. But as a community we have the reigns; we have the power to steer a course, to outline a shape, to work on building something needful together. This is the true spirit of Community Supported Agriculture -- to involve a community of eaters in the life and growth of a farm. This year, we cultivated about 2 acres. 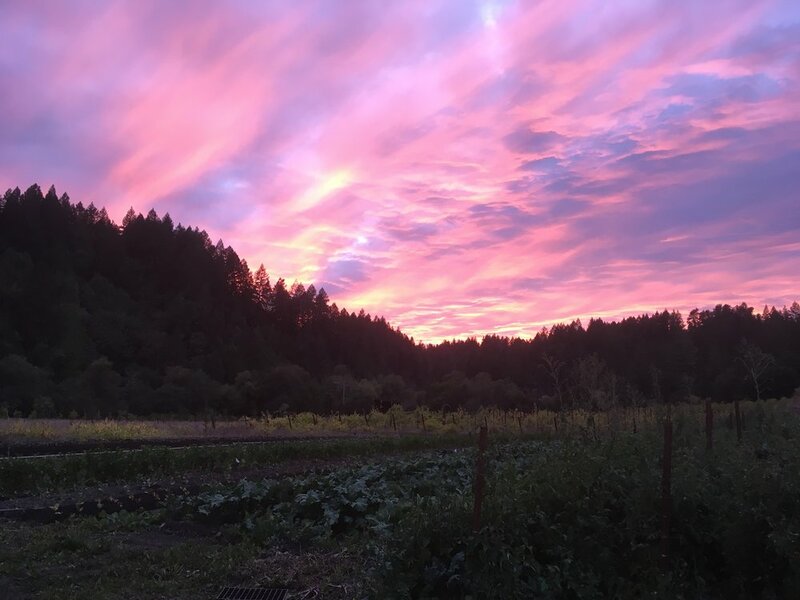 The harvest from this land was focused toward the CSA program, which reached 30 shares (households), while two summer Farmer's Markets (Forestville and Occidental), a little bit of wholesale, and donations to the CERES Community Project captured the overflow. The year was challenging in the ways we expected it would be as we established our systems and tried our trade on this land for the first time. In the end, it was a very encouraging year -- especially the CSA program. Having you all here interacting with the farm reaffirmed our love for this model of agriculture and our vision for the farm. Buoyed by this year, we'll increase the size of the CSA to around 50 shares next year (tell your friends!) while dropping the Forestville Market. We'll plant about the same acreage, refine our systems and our crop planning, and plant our first fruit trees. We're excited for the raspberry canes and the strawberry patch to experience their first true spring. Otherwise, next year should look much the same this one has, with its own unique terroir and it's own story. As the years role on, as the CSA grows by word-of-mouth, as the perennials grow, and as Kayta and I grow as farmers, we envision Green Valley Community Farm as an exclusively CSA farm supported by around 200 shares. At 200 shares, couple farmers can start making a living, and this number is around what we feel our land base can support while allowing us to rest fields in the summer... an important part of keeping things sustainable here. We envision perennial fruit in the share with fruiting trees, shrubs, and natives contouring the hillsides above the fields and quilted alongside and possibly within the lower fields, providing three dimensional, continuous habitat and refuge for wildlife... and people. We envision more shade structures, more seating areas, and pathways on the farm and connecting the fields to Green Valley Creek. We envision more animals in the mix. Already there are whispers on the wind about bringing in chickens next year. Next year, or whenever they arrive, chickens rotating on fallow fields and on adjacent hillsides will enliven the soil, the landscape, and our omelets. As soon as we get a big enough swath of resting summer cover crop, we hope to commission some of Bramble Tail's Jerseys to lend their services to the soil. We envision more farmers in the mix! We're looking forward to introducing you to our friend and farmer extra-ordinare Elliot, who'll be helping us out next year! As the farm grows we envision welcoming the gifts of fellow farmers to this land, perhaps an apprenticeship program someday when we stop being disciples. Whatever obstacles and challenges the future holds for this farm, if the vision shapes up to be half as fun as this year, the future looks bright.